Remember those connections I referred to earlier? They didn’t just arise from Charles’ circus career. Their cigar store was located in close proximity to the law offices of William McKinley.9 At the time, McKinley was serving in Congress, but by 1892 he would become governor of the State of Ohio and, in 1896, President of the United States. The Menches brothers began their concession business at just the right time. Shortly after the Civil War, the United States was hit with several boom and bust economic cycles. One of the worst was the Depression of 1882-1885. 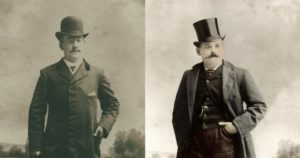 During the infamous Panic of 1884, 5% of all American factories and mines were completely shut down and another 5% were partially closed, leaving nearly 1 million people out of work.17 By focusing on country fairs and races, the Menches brothers avoided the heavily industrialized urban areas. This insulated them from the frequent late-nineteenth century recessions. With the concession business thriving at both the park and the county fairs, the Menches brothers created a confectionary manufacturer to supply their various ventures. Called “Premium Candy and Corn,” the Menches brothers experimented to create novelty products. They called one of those “Gee-Whiz” popcorn – essentially caramel popcorn and peanuts. Sound familiar? Today we call it “Crackerjacks” (although the Crackerjacks company does not refer to the Menches Brothers in their own origin story). Things didn’t go so well at Summit Lake Park when the Northern Ohio Traction company realigned their routes. Summit Lake Park found itself outside that realignment and the Menches Brothers declared bankruptcy in 1903. They came out of bankruptcy in 1904, just in time for the Louisiana Purchase Exposition. This event is more commonly known as the 1904 St. Louis World’s Fair. It was there that Charles is said to have discovered the idea of wrapping a waffle into a conical shape to create a cone to place ice cream in. The family believes it was Frank who came up with the idea of creating the cone using a “fid,” a wooden tool shaped like a cylinder to unravel rope. Whatever the origin, the idea was a hit. Selling ice cream cones at their booths, the Menches Brothers couldn’t keep up with demand. They retrofitted their Premium Candy and Corn company to produce ice cream cones and changed its name to “Premium Candy, Corn and Cone Company.” They couldn’t get a patent on the ice cream cone itself, so Charles got a patent on the next best thing – the waffle iron to make the cones. At its height, the company made 60,000 cones a day. All the while, they maintained their concessionaire business, selling sausage, hamburgers, oysters, drinks, cigars, and, of course, ice cream cones. And I hope this series makes you a little happier the next time you take a bite out of a big juicy hamburger.